I have been interested in audio equipment long before I even had a computer. My first audio system consisted of four old car speakers and a few others salvaged from old electronics, all of which were powered by a small red battery-powered radio which I partially disassembled in order to connect the speakers. I was around 8 years old at the time, and had no knowledge of proper impedance matching, yet this setup worked until I scrapped it. Eventually, I upgraded to 2 Wald Sound wooden-cabinet speakers which someone gave me for Christmas, and these were hooked up to a disassembled set of computer speakers, the tiny 7-watt (or so) amplifier driving the Walds. Later, someone gave me their old Sanyo shelf system, and I connected the Walds to this. 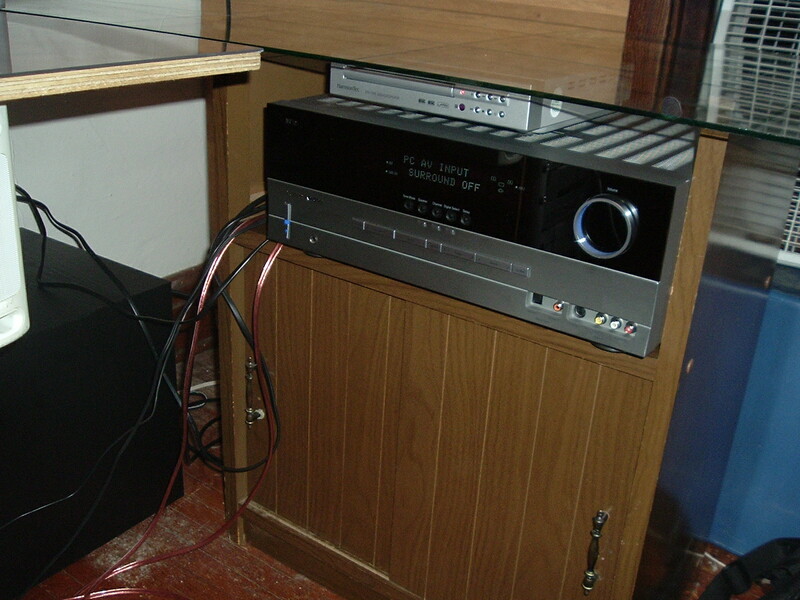 This was my audio system until I was 12, when we moved and the system ended up being connected to my parents' TV. 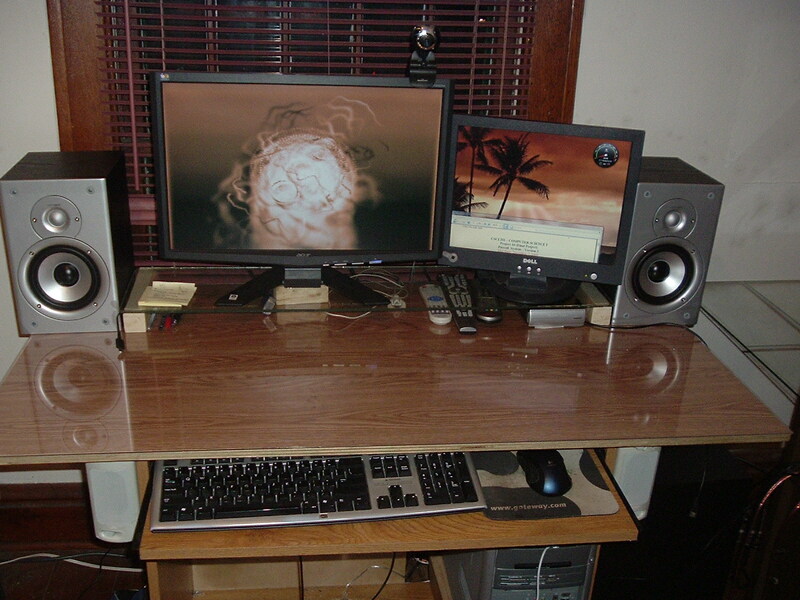 My latest computer audio setup consisted of two pairs of computer speakers which I got for free, and a 4-inch 15-watt MidiLand subwoofer that I picked up at a garage sale for $1. As can be expected, this system didn't produce high-quality sound, though it was bearable for the most part, until the subwoofer developed a very annoying rattle when played at lower volumes. This summer, I got interested in audio again, and since I now have a job, I was able to purchase some "real" equipment. 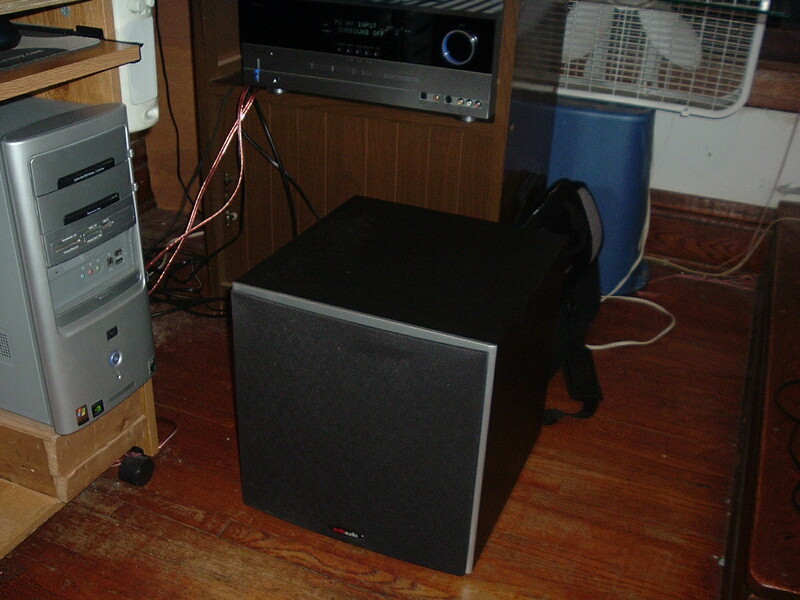 Several weeks ago, I put together my new sound system, consisting of a Harman/Kardon AVR 140 receiver, two Polk Audio Monitor 30 speakers, and a Polk Audio PSW10 subwoofer. Now, I finally have a chance to write a review. They say a picture is worth a thousand words. Click each thumbnail below to see a full-size 1600x1200 image. Let's just say that the new setup blew away my old one. It isn't particularly great from the perspective of a seasoned audiophile, but it is definitely a step above any shelf system, computer speakers, or HTIB. This is a very good home theater receiver which I found a great deal on – almost 1/5 of the MSRP (though it is an older model). I got it lightly used, with the original remote and manual, and the receiver was in excellent condition out of the box. This receiver pushes 40 watts per channel, which seems like a fairly low number, until you consider the other specs: 40 watts, all 6 channels driven, and at less than 0.07% THD (most receivers are rated with only 1 or 2 channels driven). Also, keep in mind that doubling the wattage only results in a 3dB increase in loudness (a 10dB increase, or "twice as loud", requires 10 times the wattage). I have not run it at a volume setting higher than -20dB yet, and the volume control goes up to +10, so I have no doubts about it running out of power. The AVR 140 has an intuitive on-screen display; however, this requires a connection to a TV or a TV tuner card (which I happen to have). It's possible to adjust the crossover settings for each individual group of speakers (front, front center, rear, rear center), which can come in quite useful if you're using different brands or types of speakers in your home theater setup. On the downside, it is impossible to adjust crossover settings without using the remote and the OSD. The receiver itself does get quite hot, and I've placed a small computer fan connected to a variable-voltage power adapter to keep it cool. With 6 digital inputs (3 coaxial + 3 optical, including one of each on the front panel), 2 digital outputs for recording (a first for a receiver in this price range), 4 audio/video inputs supporting both composite and S-video (including one in front), 2 YPbPr component inputs, and 2 analog audio-only inputs, this receiver will accommodate even the more complicated home theater setups. However, it lacks HDMI inputs/outputs, which is a considerable drawback at this time, since nearly all TVs, DVD players, and Blu-Ray players have HDMI connections. Note that using optical or coaxial inputs makes no difference in audio quality. I picked these up for $87 a pair on Newegg. These have been discontinued by Polk, and they originally retailed at $249 a pair. Unlike computers though, speakers don't get outdated nearly as quickly. The Monitor 30 speakers are designed with an "upside down" look, with woofer on top and tweeter on bottom. However, I was quick to notice that the speakers sounded noticeably better when placed upside down (relative to the design) with the tweeters on top. I also removed the grilles because I prefer the "naked" look, especially on these beautifully-designed black-and-silver boxes. Since I have a small room, these speakers sound too "bright" (too much treble), so I dialed the treble down 4dB on the receiver. I can hear fine details in all sorts of music, from classical to techno to heavy metal. I can also notice a difference between a CD and an MP3, and my iPod touch now sounds noticeably worse in comparison. Even my rockboxed Sansa, with my cheaper earbuds, is unable to match this system in terms of detail and fidelity. This is a 50-watt (RMS, 100W peak) 10-inch subwoofer, which seems fairly benign. But I was in for a surprise – it measures 15 * 15 * 16 inches, and is capable of shaking the whole house (though I've never turned it up that loud for fear of my parents and the neighbors yelling at me). Again, a 500-watt subwoofer would only be twice as loud. I have set the Monitor 30's to cross over at 80 Hz, which I found to be the best-sounding setting. The sub performs equally well at high and low volumes. This sub features an auto-on mode, which is quite convenient – however, it requires me to play my music at a fairly loud volume. It's convenient that the sub shuts off when I turn my music down to a very quiet setting when listening at night, but it can get annoying when I am listening at moderate levels during the day. Thankfully, there is also an "ON" setting. Unless you were using S/PDIF, you probably wouldn't want to connect a setup like this to a cheap onboard audio chip. I had a Sound Blaster Audigy 4 ever since I got my computer in late 2006, and now this card, powered by Daniel_K's modded drivers, is seeing its full potential. There is a noticeable difference when playing a CD on my Audigy 4 and on my onboard Realtek. In conclusion, this is an excellent audio setup, which provides better quality than anything else in the house. I ended up spending less on this than I would have on a set of Logitech Z-5500 speakers, and I'm glad I didn't buy them. And unlike $350 worth of computer upgrades, this system will last me many years into the future. Do you think it would sound much better than buy a pair of M-Audio 40's nearfield monitors? I'm stuck between setting up a low end system vs buying some reference monitors? Well, I'm not an audio professional by any means... but I guess it mostly depends on price and what you want to do with it. I went with the system because I wanted a subwoofer, future expandability (it's a 7.1-channel receiver), multiple inputs, S/PDIF decoding, all the good stuff. Reference monitors are designed for professional audio editing... not much else. They don't do so well for home theater use or gaming, for example. The M-Audio 40's you mentioned output 20 watts per channel and have 4-inch woofers, thus you won't get the kind of floor-shaking bass you'd get from a system with a real subwoofer.